These systems are used primarily on mobile or modular homes or older homes on a crawl space with the ductwork beneath the floor. Occasionally package units are installed on residential flat roofs with exposed ductwork. The easiest way to determine if you have a package type system (or self-contained as they are sometimes called) is to look outside at your air conditioner. Package units are generally large and will always have 2 large, square or round ducts connected directly to them. If you notice this, then you have a package unit. Package systems are identified on our site under “package unit” or “mobile home” selection links in blue navigation bar at the top of every page. 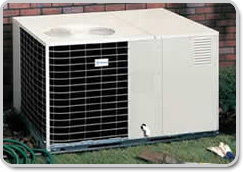 * Sometimes, in rare instances, the air conditioning package unit will reside outside with a separate, ducted heating unit inside, but this is very unusual and changes nothing for our purposes of determining system type.